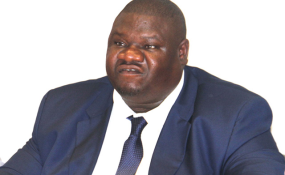 The Mineworkers Union of Namibia acting president, Allen Kalumbu. The Mineworkers Union of Namibia (MUN) is worried that the selling of Rio Tinto shares in Rossing Uranium mine to China National Uranium Corporation Limited (CNUC Ltd) will have a negative impact on its members and the communities at large. Rossing Uranium was sold to CNUC Ltd last year in November for N$1,5 billion. A statement issued on Tuesday by the MUN acting president, Allen Kalumbu, said the sale will make 90% of the country's uranium, to be owned by Chinese state owned companies. "However, we would like to believe that government and MUN will work closely to manage this new owners that they don't they don't come up with conditions directly and indirectly to negatively affect our members, the mineworkers union will not fold its hands backwards when members' interest is threatened," it warned. It concluded that job security for its members is the union's priority and they want investors who have long term solutions to the current unemployment problem and not those who will make the area a ghost town when they leave.